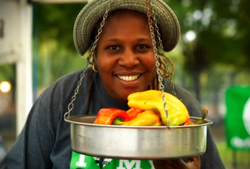 Visit Tremont Park on Tuesdays from July through October and you’re likely to see Karen Washington running La Familia Verde Farmers’ Market, which is celebrating its 10th anniversary this season. In 2003, when La Familia Verde Coalition was looking to launch their community-led market, Karen enlisted Just Food’s help to advocate with city and state agencies, figure out insurance, and connect with rural farmers to supplement produce grown by Bronx community gardeners. Working with Karen during La Familia Verde’s first years, Just Food developed a market training and a host of resources to help other community groups in underserved neighborhoods start their own markets. This season, the City Farms Market Network has grown to over 20 markets. Karen co-founded La Familia Verde Garden Coalition in 1998, when the city was auctioning off community gardens. Karen, a member of the Garden of Happiness, realized that instead of trying to fight for each individual garden, gardeners could band together and have a much better chance of survival.